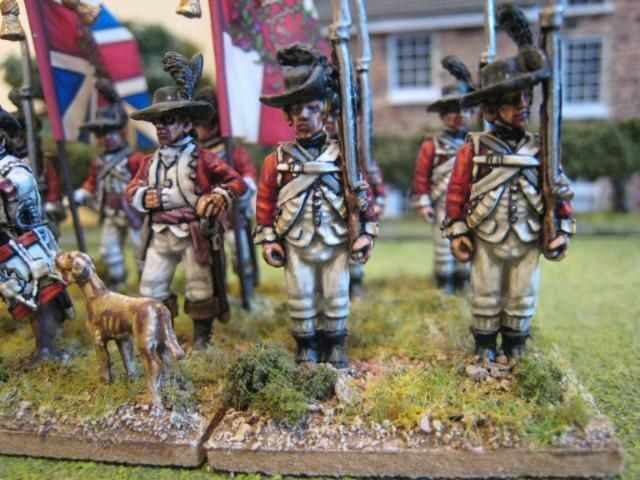 The 17th Foot began life in 1688 as Richard's Regiment of Foot. It was stationed in Flanders and Ireland before taking part in the War of the Spanish Succession. It was designated the 17th Regiment of Foot in 1751 and participated in the French & Indian Wars, being present at Louisburg in 1758 and Ticonderoga in 1759. 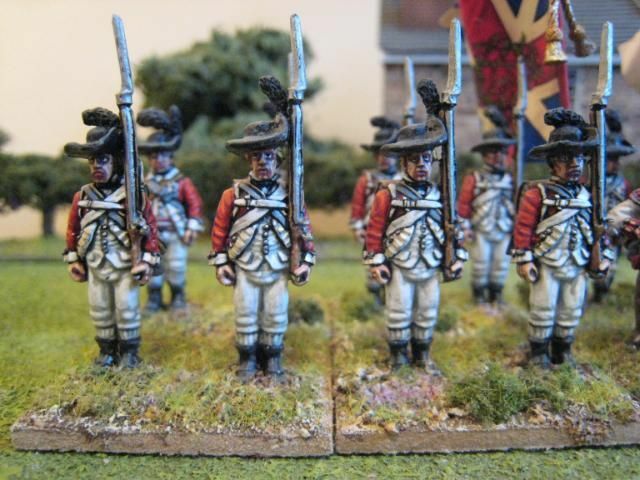 After service in the West Indies and Pontiac's Rebellion the battalion returned to England in 1767. Nine years later it arrived in Boston and fought at Long Island, Monmouth and Princeton. The regiment suffered defeat in July 1779 at the capture of Stony Point, which was garrisoned by men from the 17th and 71st regiments. 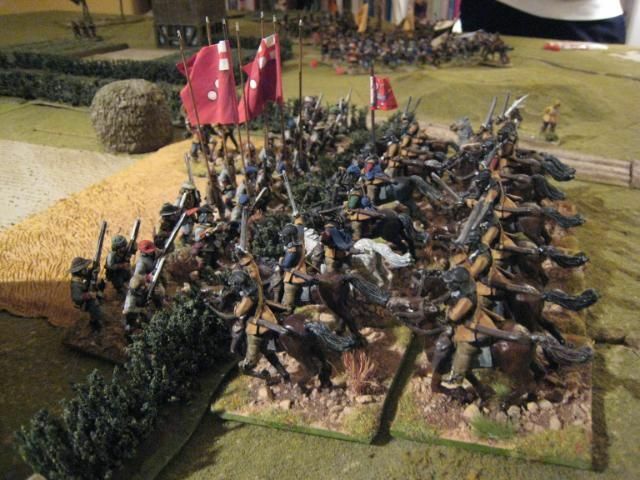 It is thought that the regiment lost its colours at this battle. The regiment also suffering the indignity of surrender at Yorktown. 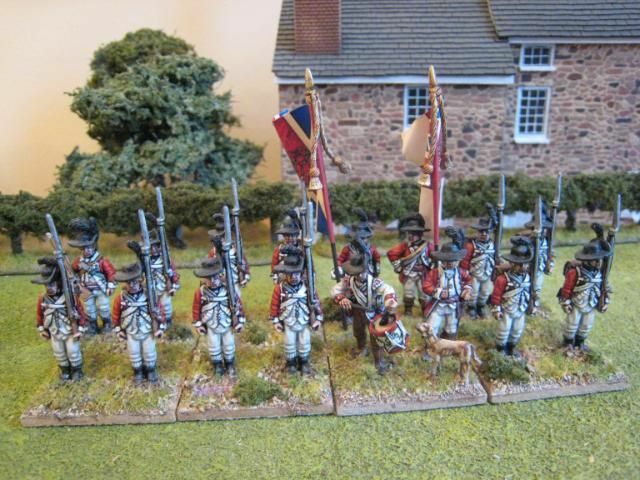 The 17th Foot is an infrequent visitor to the published "British Grenadier!" scenarios - it has a strength of 12 figures for Germantown and 16 for Long island and the early Monmouth game in the second scenario book. There are more obvious gaps in my British line collection, such as the 15th, 64th and 37th which are all mainstays of the larger 1777/78 battles. But I wanted to paint an infantry battalion that provided an opportunity for some creativity in respect of the soldiers' backpack motif. As I've noted before, there are various ways in which you can paint the flap on a backpack. I usually paint the flap in a reddish brown colour and then add a circle in the facing colour in which I paint the regimental number (like for the recent 63rd). 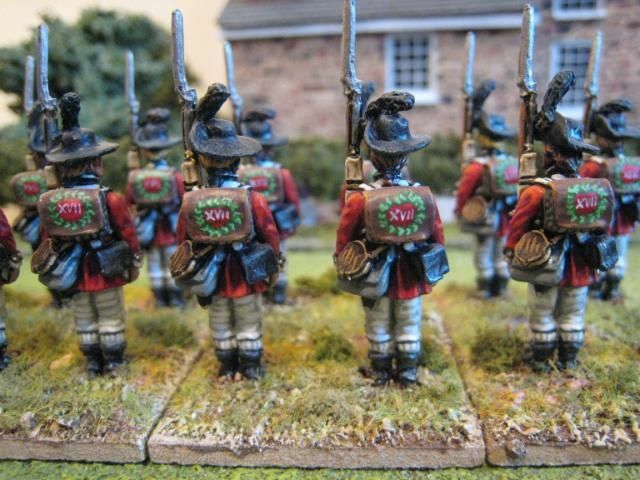 The 17th is the first of a pair of regiments which I think afford more individual treatment to the backpacks. The motif used here, which is supposed to be a laurel wreath enclosing the regimental number, was inspired by the design of the flags for this regiment as shown on the Fife and Drum website. I'm not sure where this design comes from - GMB's flags do not have this wreath. Fife and Drum suggests that the wreath was added to the colours in recognition of the regiment's contribution at Princeton (!) and I have seen this at other places. That means that the motif post-dates 1777. However, whilst accepting that this treatment of the backpacks has no basis in fact or history I think it's worth doing if only to add some variety. The dog comes with the command pack (these are all Perry figures). I painted it as a labrador/golden retriever cross, modelled on my parents' late pet Lucy. This is a lovely little model - one imagines that Alan Perry's inspiration for it may have been Gainsborough's painting of an officer in the 4th Foot. This painting gives you another colour scheme for the pooch. Rather than have the dog looking up at his officer owner as in the painting I decided to have him growling at the battalion's drummer. 16 figures. Painted October 2009. 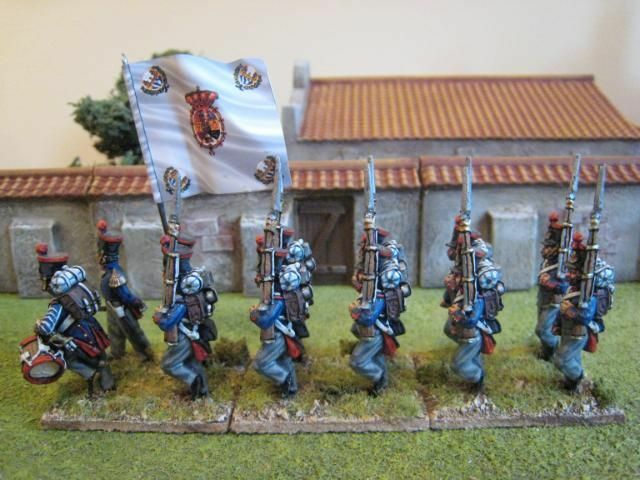 This is the companion to the Madrid Provincial Regiment I posted a couple of weeks ago. Pontevedra is a city in the north-west of Spain, on the Atlantic coast. Since its probable foundation in the first century BC the city has been an important commercial hub in the province of Galicia, although the city's importance waned from the beginning of 17th century, when its trading activities suffered as a result of a build up of sediment. However, in the early 19th century the city was reborn as a privincial capital and began to flourish again. I have no idea what Pontevedra got up to in the FCW; I've chosen this regiment, as always, because an Adolfo Ramos flag for it is available from North Star. 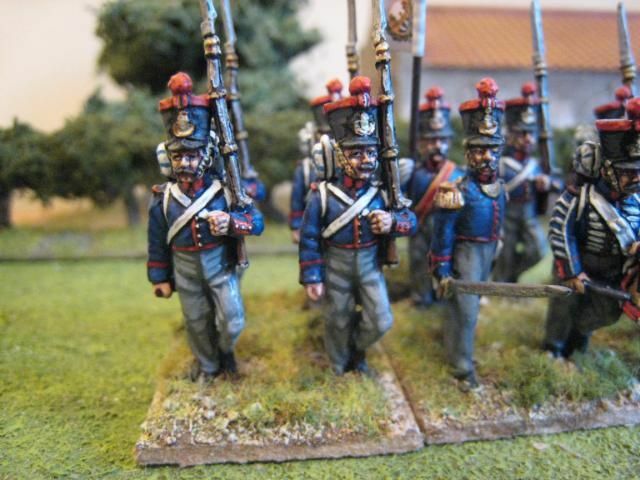 This unit again only has 12 figures, as the flank companies would have been detached to form the Royal Guard, which I hope to get around to painting at some stage. The Cairns/Perry First Carlist War book states that there could be local variations in the uniforms of these provincial regiments. I decided on a few differences for this second unit - grey trousers and then the same patterns for collars and turnbacks that I've used for the regular army line (i.e. piping rather than solid colour). 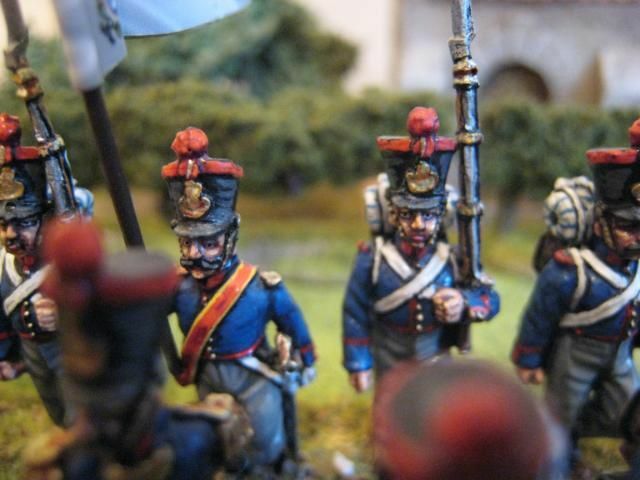 The building and wall pieces in the background are by "Tablescape" - these are part of their ready-made and painted "Peninsular War" range, which now comprises two styles of house, a church and 2 packs of walls. More AWI to post in a couple of days. 12 figures. Painted October 2009. Last Wednesday evening I headed up to north London for a try-out ECW experience with Eclaireur and chum Timmo. This was the first time that EC and I had used the "Forlorn Hope" rules; Timmo was on hand as a veteran of these particular rules (he even had a first edition copy of the, er, first edition!). 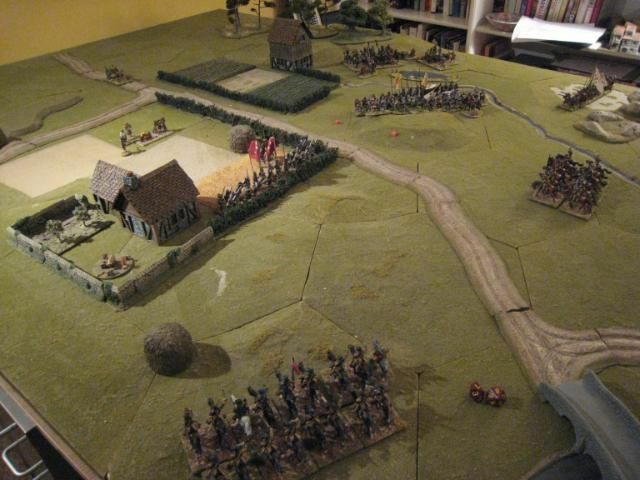 I brought up my modest ECW collection of 3 foot regiments and some vignettes, although in the end only Rupert's Foot went on the table as EC's collection has outstripped mine by some distance. 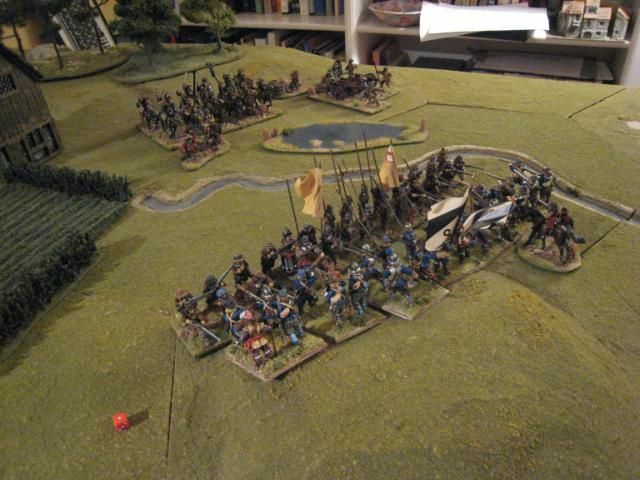 EC's troops are a mix of Warlord and Perry, with a few Bicorne mixed in; the photos below show how well they fit together. 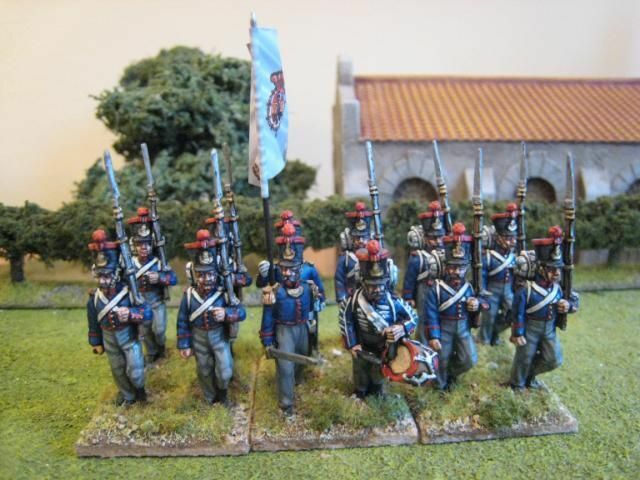 As I've said on other fora, I think that Bicorne provide a good central point for ECW figures - you can then "go large" by mixing them with Renegade and Reboubt or "go small" by mixing in Perry and Warlord. I've gone the former route, but Rupert's Foot did not look significantly larger than their opponents, so there is clearly scope for extensive mixing and matching in this period. We didn't play out a battle but rather tested different types of combat. Rupert's Foot advanced against a Parliament regiment to try out infantry combat. 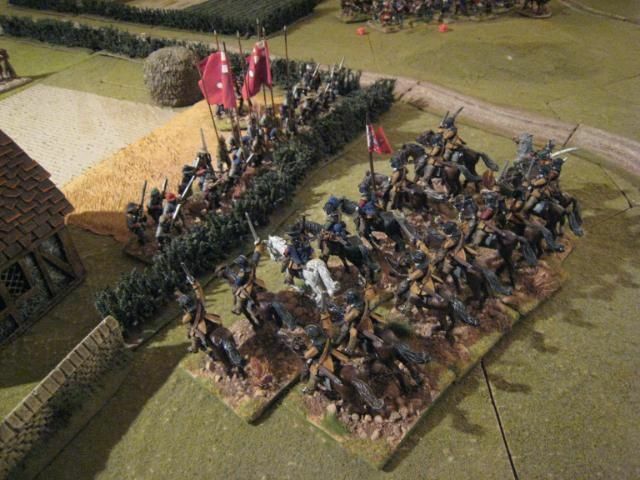 A little later we had some cavalry charge more Parliament foot that had deployed behind a hedge. The mechanics of "Forlorn Hope" certainly take some getting used to. 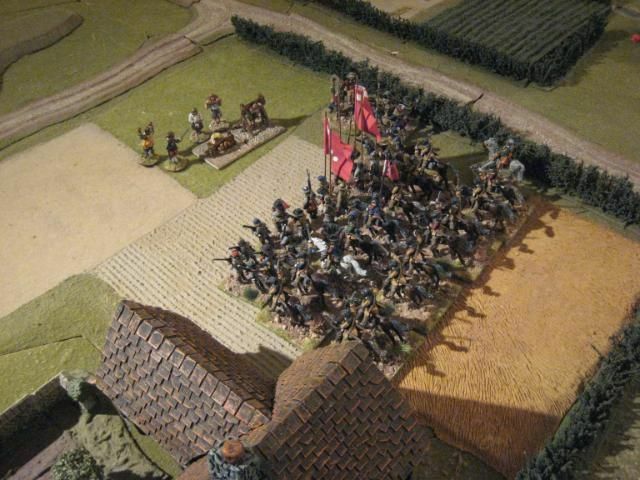 I found the calculation method for firing rather confusing and the melee result for the cavalry charge produced a very one-sided result, with the infantry breaking immediately - they didn't see to have any + modifier for being behind a hedge and so "in cover". 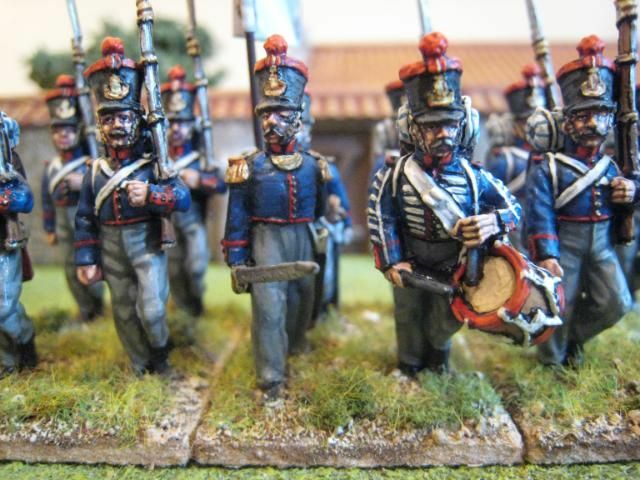 As a player you clearly need to be wise to the effect that troop grading and the ratio of pike to musket have on your ability to fire and melee effectively. Orders also have an important role as there seem to be several different "advance" orders that a unit can be on, and which influence what you can do. So a bit of home play will be required to get the hang of the rules. Apologies for the lack of posts of late. I actually have 3 units painted and varnished, but as yet unbased due to the chaos caused by having 2 bathrooms re-fitted and a general tidy-up of the rest of the house. Thanks to that, and also work, I've only finished 3 figures since the end of the previous weekend, which I think is an all-time low. But I'm going to see if I can crank up production a bit over the last couple of weeks before BBE (Before Baby Era). I'm currently trying to finish two First Carlist War regiments and some more Crusaders, the latter in order to try out some new Foundry triads that I bought in their recent 20% off sale (the new WW2 colours mostly). You can't have too many civilians for the AWI. Well, I suppose there probably is an upper limit on what would look good on a table, but non-combatants always enhance a game and can make a welcome change to painting military types. 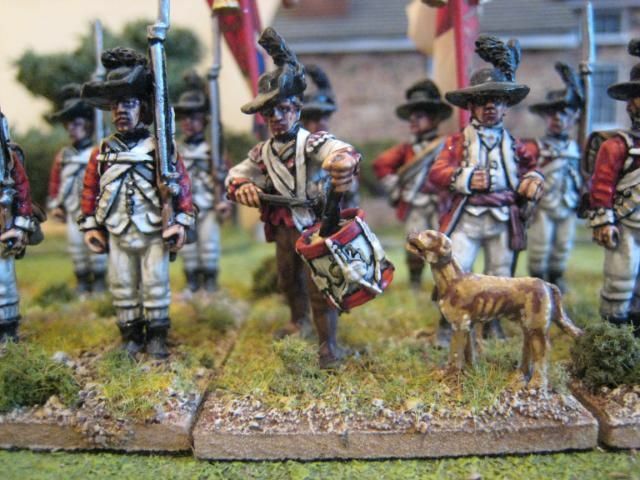 Many of the AWI's engagements were fought across villages and townships and civilian onlookers have provided memorable accounts of the fighting they witnessed (for examples, do visit the utterly outstanding "Boston 1775" blog). 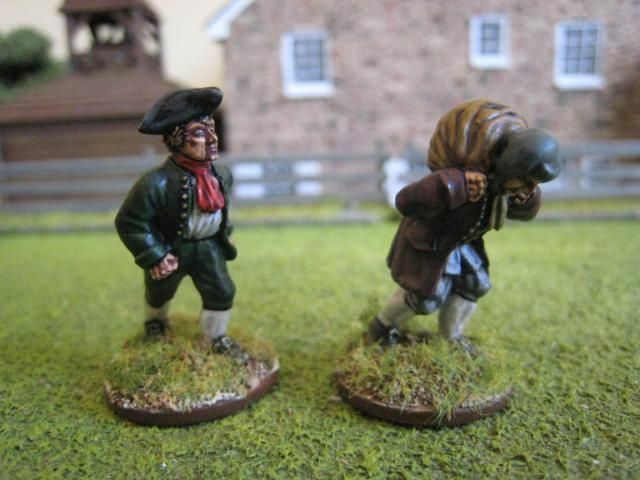 These figures are from Front Rank and are the contents of one of the packs in their 18th century civilians range. 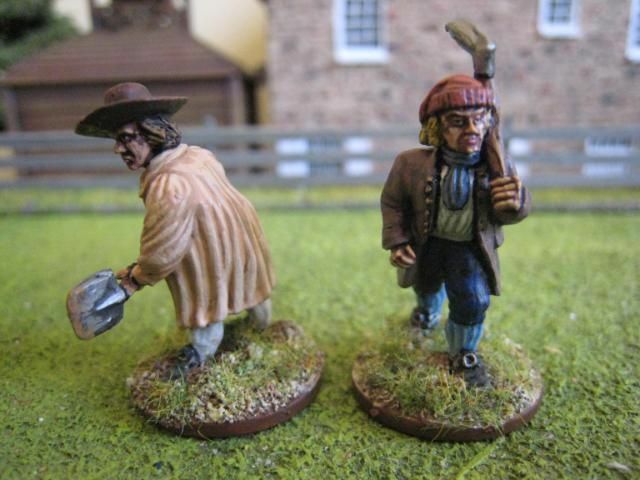 The figures have the trademark Front Rank chunkyness that makes them look very Billy Bunter-ish in comparison to Perry Miniatures, Eureka and some other manufacturers; it's not so much the faces but more the enormous calves that look a bit out of place - in this they are a better fit with the Foundry 18th century civilian figures. That said, I'm quite fond of Front Rank and these figures are a useful addition to the non-combatant ranks. There seems to be a "labourers" theme to this particular pack and I bought it for last November's Long Island game. 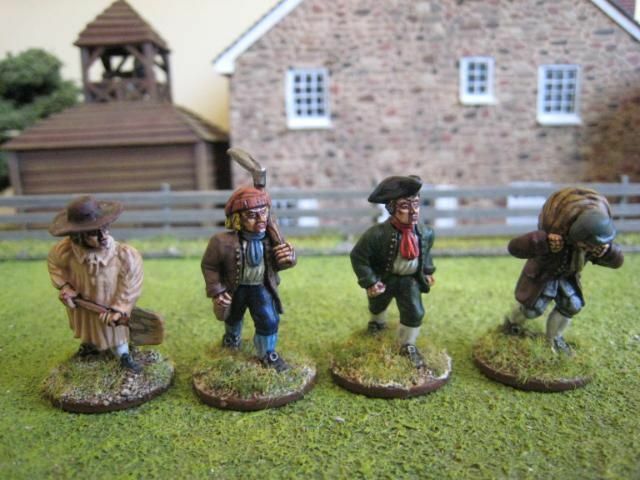 I had intended to paint all 4 figures to put in the Brooklyn earthworks as hired help. As it happened, the only figure I managed to complete in time for the game was the chap with the shovel. I saw the other 3 figures in my "to do" box the other week and decided it was high time to finish them off. The only other Front Rank figures that I have in my collection are some militia based up as skirmishers and a couple of casualties. The 25mm range as a whole is nicely sculpted, if you like the chunkier style, but I think it is now showing its age and has been eclipsed by the Foundry/Perry/Eureka troika. But the civilians are still worth buying! 4 figures. Painted October 2008 and October 2009.